The Advisory Neighborhood Commission meeting will be next Tuesday. Details, agenda, and minutes from the October meeting are posted below. This agenda looks very different from past meetings and outstanding business issues have been moved to the earlier part of the meeting. The next 5D Advisory Neighborhood Commission (ANC) meeting will be held on October 13, 2015 at 7 pm. The meeting will be held at the 5th District Police Station located at 1805 Bladensburg Rd NE. While the meeting has been announced, the agenda has not been conveyed by the Chair. We will provide information on the agenda if that is available from the ANC prior to the meeting. Minutes from the September 8, 2015 meeting were distributed via neighborhood list serves with the meeting announcement. The minutes can be accessed from the link below. 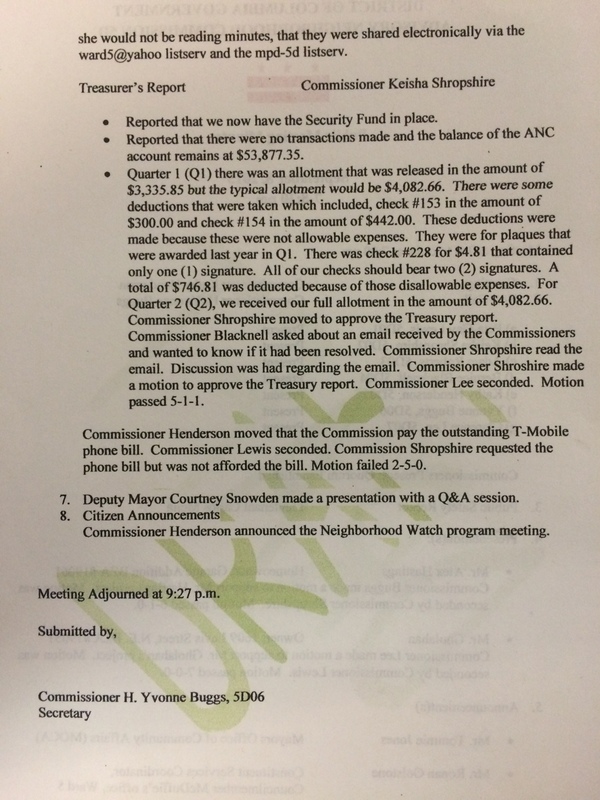 Please note that the email referenced in the minutes (see link below) under the Treasurer’s Report section was from the Auditor’s office concerning a Commissioner, not named in the message, that was visiting bank branches to try and move funds from the ANC account. The Auditor’s Office noted that they froze the bank account and would keep the ANC checkbook until the matter is resolved. This potential theft, abuse, or misuse of ANC funds should be of concern to all 5D residents. Per the email read in the meeting, the banks would not allow the transfer of these public funds as the account cannot be accessed by one individual (two signatures required for transactions) nor can they be moved by one individual. The Chair noted in the meeting that this information came to light in an abuse of power by the Office of the ANC and she has filed charges with the Attorney General as a result but she was not concerned that someone tried to access and move funds as noted by the bank. Hopefully at the meeting on October 13th there will be discussion on resolution of this troubling incident or series of events. 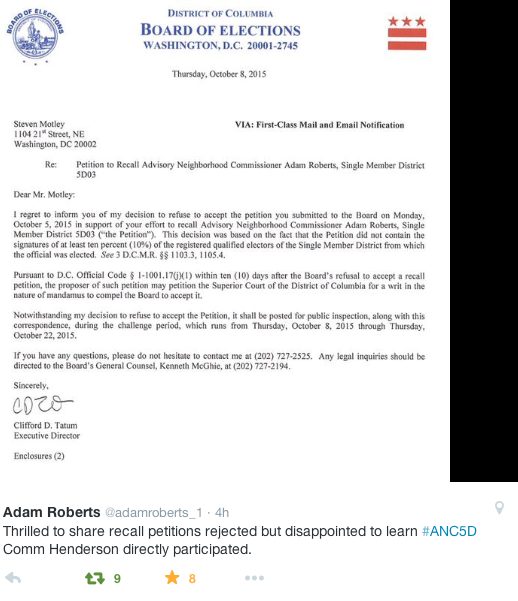 ANC5D September meeting video can be accessed here. The section on the attempt to move funds from the account begins at around minute 21. This is in the 3rd video of the meeting. You can watch the entire meeting (five total videos) if interested. Part 4 of the meeting includes discussion of an ongoing issue with past due phone bills. 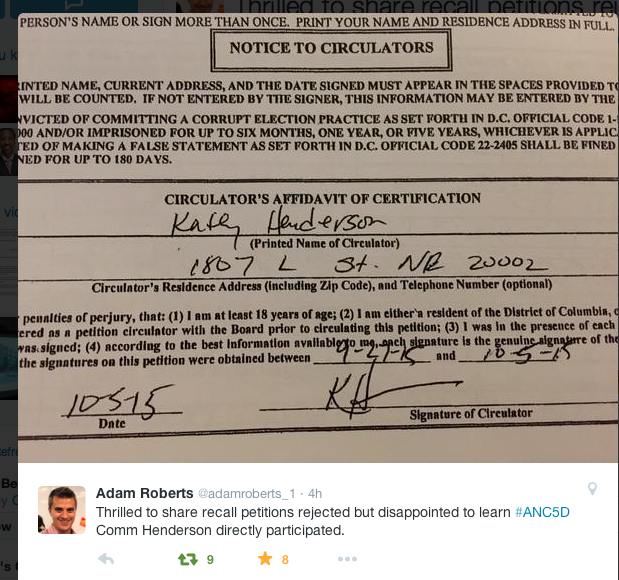 ANC5D pays for phone bills on at least two unpublished phone numbers for certain Commissioners. Bills from January to present, for over $2,000, have not been shared with the Treasurer. A previous version of this was published during editing. Apologies for the inconvenience. 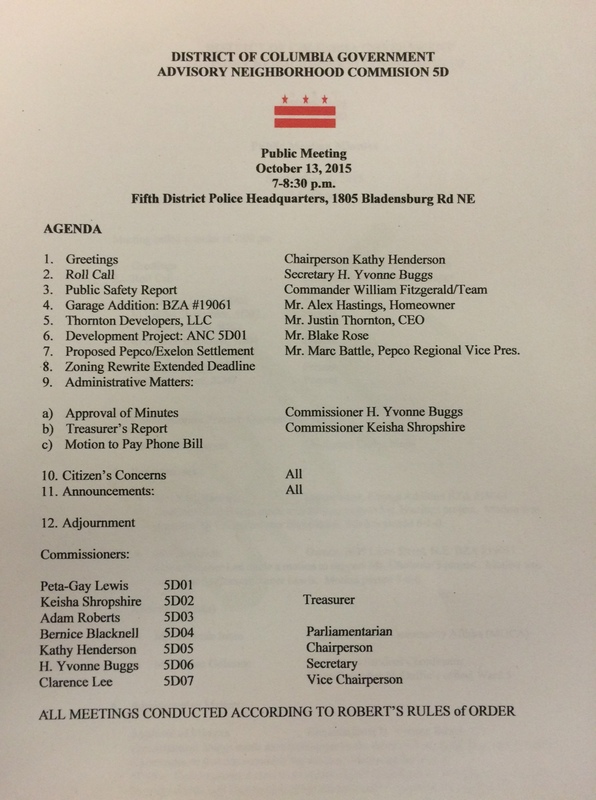 Did you Miss the ANC5D Meeting this Week? You can catch up on what you missed at the ANC5D meeting this week as it was all caught on video. Check out Edward Milton’s ANC5D 9-8-15 Meeting playlist on YouTube. The video is broken down into 5 parts. Trinidad residents @FrozenTropics and @ker_dc also live-tweeted from the meeting so take a look at their feed from Tuesday night. There is some good stuff here so grab some popcorn. The agenda for the Advisory Neighborhood Commission meeting tonight at 7 pm at the 5th District Police Substation has been published. It is copied below as distributed by email.